2018 Moto Guzzi Stelvio 1200 NTX. Picture credits - Moto Guzzi. Submit more pictures. It all starts with style, now even more attractive and trendy rounding off the fuel tank by integrating it within the lightweight fairing, which now highlights a clearly smooth streamlined effect which flows into the double front headlight assembly. The latter feature is a distinctive element of the Stelvio design, and the only detail inherited from the previous version. Price as new (MSRP): US$ 16190. Prices depend on country, taxes, accessories, etc. Fuel system: Injection. Magneti Marelli IAW5A phased, alfa-n system; two � 50mm throttle bodies, Weber IWP 189 injectors, lambda probe. Exhaust system: Stainless steel, 2-in-1 type, three-way catalytic converter with lambda probe. Front suspension: Completely adjustable fork (spring preload and hydraulic compression and rebound damping) with 45 mm diam. upside down stanchions and caliper mounting for radial brake calipers. Rear suspension: Single arm with progressive linkage, monoshock with adjustable hydraulic rebound damping and spring preload adjuster knob. Front brakes: Double disc. Brembo. Stainless steel wave discs, radial calipers with 4 opposed pistons. Rear brakes: Single disc. Brembo. Single fixed stainless steel disc, floating caliper with 2 parallel pistons. Ask questions Join the 18 Moto Guzzi Stelvio 1200 NTX discussion group or the general Moto Guzzi discussion group. Bikez.biz has an efficient motorcycle classifieds. Ads are free. Click here to sell a used 2018 Moto Guzzi Stelvio 1200 NTX or advertise any other MC for sale. 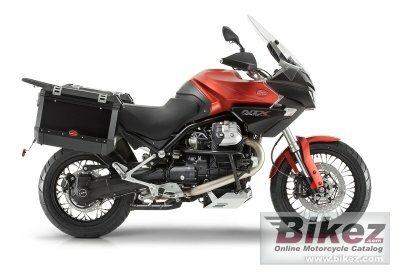 You can list all 2018 Moto Guzzi Stelvio 1200 NTX available and also sign up for e-mail notification when such bikes are advertised in the future. Bikez has a high number of users looking for used bikes. Before you buy this bike, you should view the list of related motorbikes Compare technical specs. Look at photos. And check out the rating of the bike's engine performance, repair costs, etc.